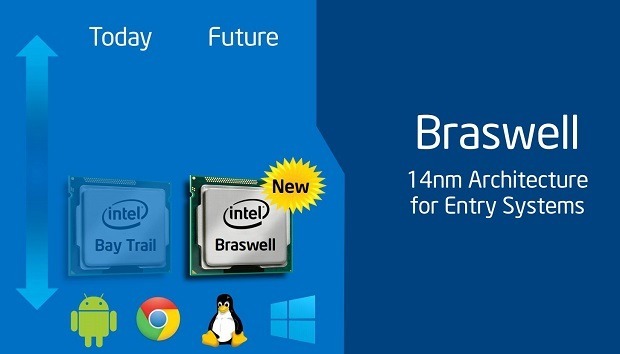 Intel’s upcoming Braswell Processors are quite something. They are basically very power efficient SoCs for the entry level segment of Desktop Computing. Basically Intel did not have any real offerings in the “HTPC (Home Theater PC) Segment” and is ready to get a piece of the pie. Intel has started taking mobile computing seriously only in these past few years and the consequences of the same are already becoming apparent ( in a good way). Currently the only core that comes near the archetype of Braswell is the Bay Trail Core however the Braswell will be one performance tier above the Bay Trail processors while still retaining the same power efficiency (which is quite a feat). Now here is the thing, our source CPU-World.com tell us that even though the 14nm Braswell SoCs were coming in Q1 2015, the “ready to ship” timeframe for the same might have moved to Q2 of 2015. The reason for this being that Intel is working in mysterious ways this year. This also means that we would be catching the first glimpse of these processors in mid march or mid may of next year. Intel has already released two refreshes of the Bay Trail platform, each iteration more powerful than the previous. There is another refresh coming in Q4 2014 to top it all of. However, a power vacuum remains between the mainstream Desktop Processors (currently Haswell Refresh) and the atom processors. It is this vacuum that Braswell will fill. We also have the Core M processors coming soon along with Cherry Trail so it looks like Intel is going all out on the mobility spectrum of computing which is about damn time. Currently this particular segment is dominated by AMD’s APUs and it is clear that Intel wants in on the action. These processors are an ideal choice for people who want a “streaming box (Steam’s inHouse Streaming) ” in their lounge in an ultra small form factor. With your real rig somewhere else in the house, an HTPC serves as the ideal “front end”.